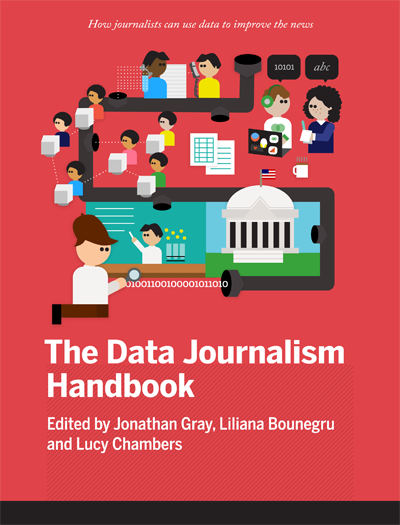 The Data Journalism Handbook – a free, open-source book that aims to help journalists to use data to improve the news – has been released today at the International Journalism Festival in Perugia. The book is an international, collaborative effort involving dozens of data journalism’s leading advocates and best practitioners – including from Australian Broadcasting Corporation, the BBC, the Chicago Tribune, Deutsche Welle, the Guardian, the Financial Times, Helsingin Sanomat, La Nacion, the New York Times, Pro Publica, the Washington Post, the Texas Tribune, Verdens Gang, Wales Online, Zeit Online and many others. It is freely available online at datajournalismhandbook.org and a print version is forthcoming from O’Reilly. Lamentably the act of reading this book will not supply you with a comprehensive repertoire of all of the knowledge and skills you need to become a data journalist. This would require a vast library manned by hundreds of experts able to help answer questions on hundreds of topics. Luckily this library exists and it is called the internet. Instead, we hope this book will give you a sense of how to get started and where to look if you want to go further. Examples and tutorials serve to be illustrative rather than exhaustive. We count ourselves very lucky to have had so much time, energy, and patience from all of our contributors and have tried our best to use this wisely. We hope that – in addition to being a useful reference source – the book does something to document the passion and enthusiasm, the vision and energy of a nascent movement. The book attempts to give a sense of what happens behind the scenes, the stories behind the stories. This entry was posted in data, datajournalism, datajournalismhandbook, projects. Bookmark the permalink. Comments are closed, but you can leave a trackback: Trackback URL.